Israel is engaging on a plan to ‘Judaify’ the Negev desert area in the south. It is sparsely populated and most of its inhabitants are Bedouin. Thousands of them were expelled into neighbouring countries from 1948 until the mid 1950’s and those who remain live in ‘unrecognised’ villages. That means they have no mains water, electricity, state schools, sewerage etc. It also means that they are liable to be demolished at a moments notice. Al Araqib has been demolished over a hundred times and in January Umm al-Hiran was demolished. One protestor, a school teacher, was murdered by the Police who fired rubber bullets at the leader of the Joint Jewish-Arab list in the Knesset, Aymen Odeh, injuring him. The reason to demolish Umm al-Hiran was to build a Jewish town, Hiran, in its place. In other words naked Apartheid. 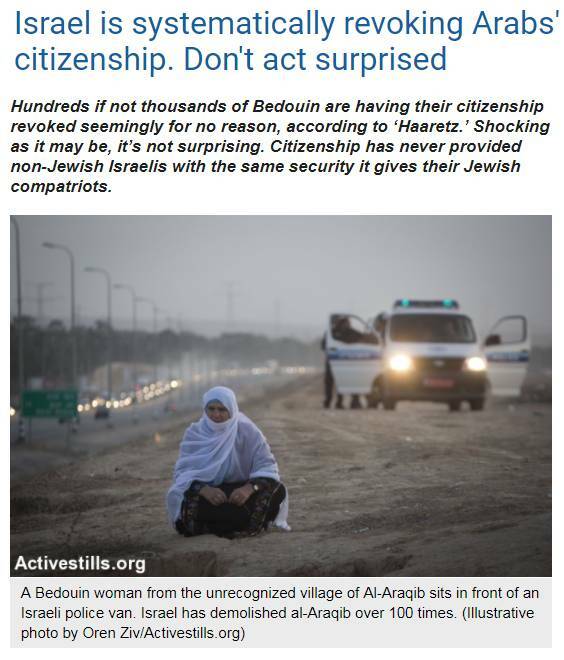 That is the context in which thousands of Bedouin are having their Israeli citizenship revoked at a stroke of a bureaucrat’s pen. The reason given is that they were registered as citizens by mistake. They have lived in what is now Israel all their lives. They are the indigenous population, unlike the Jewish settlers who came mostly after them, but that doesn’t count. It as all a mistake and so they are no longer citizens. In fact they never were citizens! Of course this could never happen to a Jew because if you are Jewish you have the automatic right under the misnamed Law of Return to go to Israel and claim citizenship. If I were to go to Israel and claim citizenship I would have to be granted it even though I have never lived there. Arabs who have lived in Israel for hundreds of years can have their citizenship revoked immediately. This is not accidental. It is the product of a Jewish state where Arabs live in it by sufferance only. In Jerusalem thousands of Arabs who had permanent residency cards are now having them revoked too. What is surprising is that some people in the West still see Israel as a democratic state. Imagine going to renew your passport or change your official address and after a few minutes of pattering on a keyboard without looking up to see the human being in front of him or her, a government clerk informs you that you are no longer a citizen of the only country you have ever known. The country of your birth. And no, it’s not that your citizenship is being revoked, the clerk calmly explains. It’s not like that. You were never a citizen in the first place, you see, it was all a mistake — never mind the fact that you were born in Israel to parents who are Israeli citizens, and your siblings are Israeli citizens, and maybe you even served in the Israeli army. Hundreds if not thousands of Bedouin citizens of Israel have undergone that exact terrifying experience in recent years, according to a report by Jack Khoury in Haaretz Friday. The Kafqesque ordeal, to which Jewish Israelis are exempt, is part of a policy in which one’s citizenship is re-adjudicated, without a judge or judicial process of course, every time one comes into contact with an Interior Ministry clerk for the most routine reasons, according to the Haaretz investigation. The gut-wrenching practice is shocking on the most basic levels. For those of us lucky enough to be citizens of a country, so much of our security in this world comes bundled up with it. Of course, Palestinians and other non-Jews have never had the same level of security attached to their citizenship in Israel as their Jewish compatriots do. Many of them, like the hundreds of thousands of Palestinians from East Jerusalem, don’t even have citizenship to begin with. As shocking as the Haaretz report is, nobody should be surprised. The Israeli prime minister has openly declared his belief that some, namely Arab, Israeli citizens should be stripped of their citizenship for making political statements not to his liking. A senior government minister recently threatened a “third Nakba,” referencing the largely forced displacement of 700,000 Palestinians in 1948. And then there was the landmark ruling earlier this month actually stripping a Palestinian-Arab man of his Israeli citizenship because of his familial lineage. Let us not forget the more-than 14,000 Palestinian residents of East Jerusalem who have had their permanent residency status stripped of them over the years, sending them into exile. Again, none of this should be news. Israel is not a state of all its citizens — any minister in the current Israeli government would be happy to tell you as much. Advocating turning Israel into a state with those types of liberal-democratic building blocks is considered nothing short of seditious. It is antithetical to Zionism as it has come to be defined in the contemporary Israeli zeitgeist. It should also be no surprise that attempts to reduce the number of Arab citizens are taking place in the Negev desert, where every Israeli government has tirelessly worked to establish Jewish hegemony in the sprawling desert that comprises more than half of Israel’s land mass. The latest iteration of those plans, The Prawer Plan, which sought to displace some 40,000 Bedouin citizens living in dozens of “unrecognized” villages, was just one in 70 years of similar efforts. Currently, the Israeli government is finalizing the destruction of the Bedouin village of Umm al-Hiran in order to build a new settlement in its place — for Jews only. Imagine the feeling of living under a regime which views your very existence as a strategic threat; one out of every five Israeli citizens do. A state that belongs less to some of its citizens than others, which sees some of its citizens as assets and others as liabilities, which bestows inalienable rights upon some and views others as expendable — is not a just state. After 70 years, the question is no longer whether Israel can balance its Jewish and democratic character. The question is which of them it has chosen. Even that debate won’t be relevant for much long. The Israeli Knesset is scheduled to advance the “Jewish Nation-State” law in the coming weeks. The government-supported bill, which is the equivalent of a constitutional amendment in Israel’s system, would explicitly favor the country’s Jewish character over its democratic character. Abu Gardud Salem from the village of Bir Hadaj of the Azzamah tribe on August 18 became a man without citizenship after a trip to Israeli immigration offices. Dozens of people – men and women, young and old – crowd into a big tent in the unrecognized village of Bir Hadaj. Some hold documents in plastic bags while others clutch tattered envelopes. What brought them to this village south of Be’er Sheva in Israel’s Negev desert was that the Population, Immigration and Border Authority had revoked their citizenship, claiming that it had been awarded to them in error. 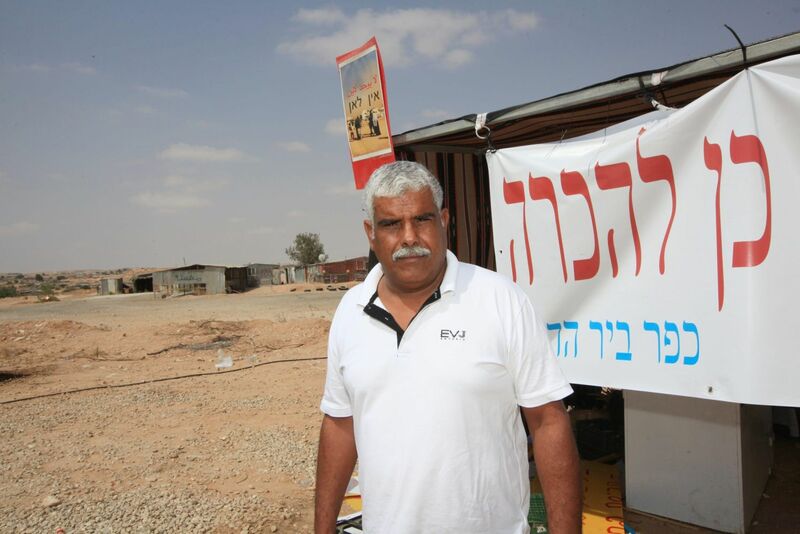 Judging by the increasing number of complaints piling up in recent months, this appears to be a widespread phenomenon among the Negev’s Bedouin residents. Hundreds if not thousands of them are losing their citizenship due to “erroneous registration.” This is the reason they get from the Interior Ministry, with no further details or explanation. Fifty-year-old Salim al-Dantiri from Bir Hadaj has been unsuccessfully trying to obtain Israeli citizenship for years. He doesn’t understand why Israel won’t grant it to him; his father served in the Israel Defense Forces. “Sometimes they say there was a mistake in my parents’ registration dozens of years ago. Is that our fault?” asks al-Dantiri. He’s not the only one, but many of those who came to the meeting were reluctant to identify themselves out of concern that it might hurt them in their interactions with the Population Authority. Others have already given up hope. 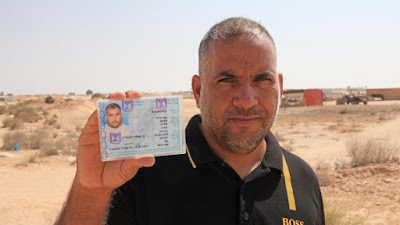 For years Yael Agmon from nearby Yeruham has been accompanying Bedouin to the Interior Ministry to help them apply for passports or update their identity cards. On many occasions, she has witnessed their citizenship being revoked. “You can clearly see how a clerk enters their details into a computer and then they instantly lose their citizenship. They then have to contend with an endless bureaucratic process. Sometimes it costs them tens of thousands of shekels in lawyers’ fees, and they don’t always get their citizenship in the end,” she says. 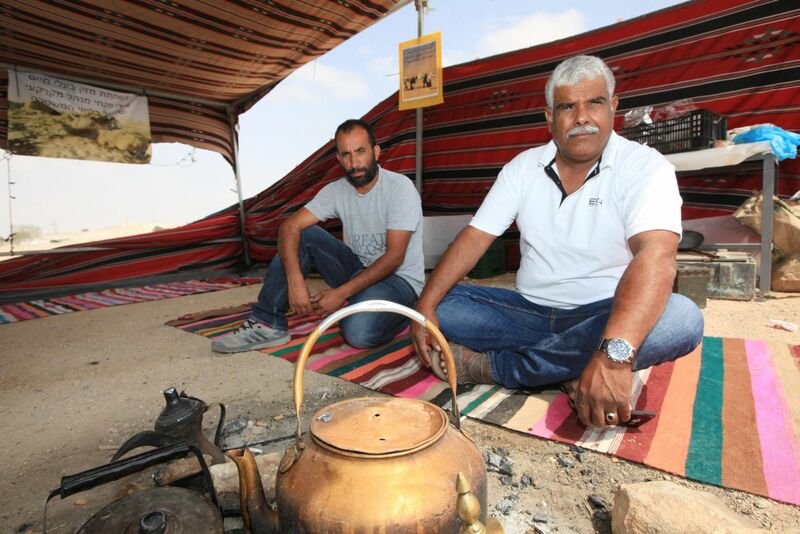 Salman al-Amrat came to the tent gathering because of his wife’s and oldest son’s status. The 56-year-old member of the Al-Azazme tribe is an Israeli citizen. His 62-year-old wife is stateless even though she was born here, he says. “Every time we try to get her citizenship we are met with refusal.” Al-Amrat’s oldest son, now 34, is also without citizenship even though his younger brothers ultimately received theirs. “We’ve been trying for years to obtain citizenship for him but to no avail. Every time they say some documents are missing. Now we’re trying through an attorney. It’s illogical that six of my children and I have citizenship and my oldest son doesn’t,” he says. 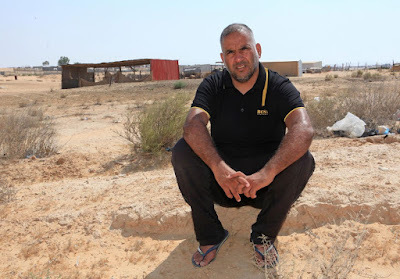 Atalla Saghaira, a resident of the unrecognized village of Rahma, fought for 13 years to obtain his citizenship, even though his late father served in the IDF. He started the process in 2002, when he applied for a passport and the Interior Ministry refused to give him one. “They said that my parents had become citizens but weren’t ones to begin with,” he says. He finally obtained Israeli citizenship in 2015. “I insisted on my rights and waged a campaign against the bureaucracy by myself until I obtained citizenship, but I know there are some people who give up,” he says. Saghaira’s father was a tracker in the army for several years, and left after sustaining an injury. At the time, he had seven children (including Attala), but three of them still are still stateless. Lawmaker Aida Touma-Suliman of the Joint List has received many appeals in recent months from people who have been stripped of their Israeli citizenship. Attorney Sausan Zahar from the Adalah Legal Center for Arab Minority Rights in Israel recently appealed to Interior Minister Arye Dery and to Attorney General Avichai Mendelblit, asking them to cancel this policy. According to her petition, these sweeping citizenship cancellations has been going on at least since 2010. When Bedouin citizens come to Interior Ministry offices in Be’er Sheva to take care of routine matters such as changing their address, obtaining a birth certificate or registering names, the Population Authority examines their status, as well as that of their parents and grandparents, going back to the early days of the state. In many cases, the clerk tells them that their Israeli citizenship had been granted in error. On the spot, he changes their status from citizen to resident and issues them a new document. People who lose their citizenship are given no explanation and no opportunity to appeal. Instead, the clerk suggests that they submit a request and start the process of obtaining citizenship from scratch, as if they were newcomers to Israel. Many, caught by surprise and without legal advice, don’t know what to do. Some submit a request for citizenship while others simply give up in despair. 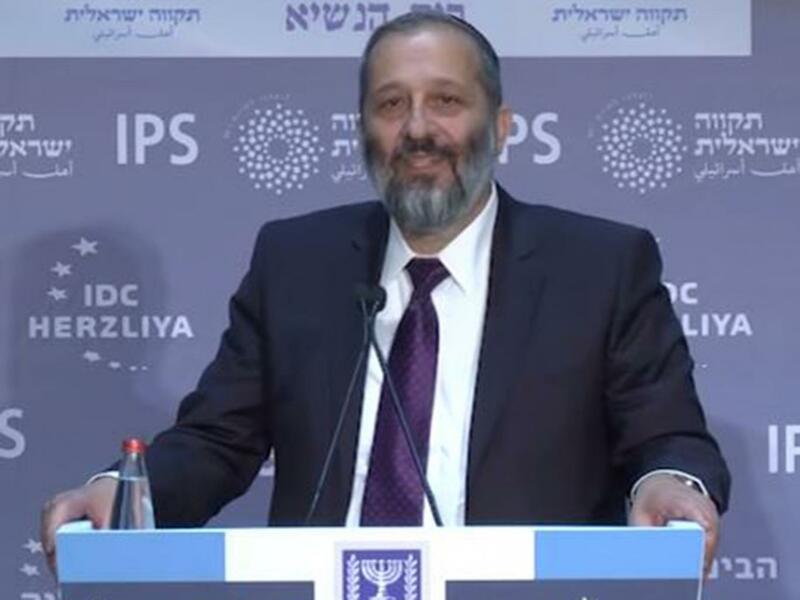 Zahar says that many requests are denied due to missing documents, a criminal record (not a valid reason for denying citizenship) or even the applicant’s inability to speak Hebrew. Many Bedouin women who have been stripped of citizenship fall into the latter category. One such woman filed an appeal over the cancellation of her citizenship due to an alleged error. When it turned out that her Hebrew was lacking, her appeal was rejected. She remains stateless. Adalah’s petition to the interior minister shows that individuals who have been citizens for 20, 30 or even 40 years, some of whom served in the army, who voted and paid their taxes, had clerks cancel their status with a keystroke. As permanent residents, they can vote in local elections but cannot run for office, vote in national elections or run for the Knesset. They receive social benefits such as medical insurance and national insurance payments, but cannot receive Israeli passports. If they are out of the country for prolonged periods of time, they can also lose their permanent residency, and unlike citizens, they cannot automatically transfer their status to their children. Among those who remain without Israeli citizenship are people born in Israel to parents who are Israeli citizens. There are families in which one child is a citizen while another is a permanent resident. Some of those affected were stripped of their citizenship when they tried to renew their passports to go on the pilgrimage to Mecca, a mandatory tenet of Islam and something they now cannot do. The Knesset’s Interior and Environment Committee held a discussion on the issue last year, following an accumulation of requests to reinstate citizenship. During it, Interior Ministry officials confirmed that such a policy exists: When Bedouin citizens come to the ministry’s offices, clerks check the population registry for records of their parents and grandparents between 1948 and 1952. Perhaps these years were not chosen by chance. Between the founding of the state in 1948 and the passage of the Citizenship Law in 1952, many Arabs could not register with the population authority since their communities were governed by a military administration. This included areas in the Negev which had a high concentration of Bedouin residents after 1948. In many cases, checking the records of an individual's grandparents entails looking at their citizenship during the British Mandate – a time when Israeli citizenship did not even exist. After last year's Knesset discussion, the Interior Ministry was asked to check the extent of the phenomenon and its legality and to then update the Interior Committee. The head of the ministry's citizenship department, Ronen Yerushalmi, submitted the findings to the committee's chairman, David Amsalem (Likud), in September 2016. Entitled “Erroneous Registration of Negev Residents,” the report said that “the extent of the problem could involve up to 2,600 people with Israeli citizenship, who could lose it due to erroneous registration by the Interior Ministry.” It added that since individual cases had not been examined, the data was not precise and the numbers could even be higher. Adalah’s appeal to the interior minister and the attorney general demands an immediate halt to the citizenship cancellation policy. Zahar argued that the people affected by it don’t even have the right to a hearing before their Israeli citizenship is taken away from them. In addition to infringing on their right to citizenship, she wrote, the policy blatantly infringes on their right to equality. It is discriminatory based on nationality, since no Jewish citizen has had his citizenship revoked due to a mistake in his parents' or grandparents' registration under the Law of Return. The Population Authority said in response that the cases mentioned above were not instances of revoked citizenship but ones of past registration mistakes, in which people had been registered as citizens but were not. It said now was the time to fix the problem, adding that the ministry held a discussion on the issue, the minister had taken a decision and the Knesset's Interior Committee had been informed. It said that “attempts are being made to address this problem legally in a manner that won’t affect these individuals' status in Israel.” The Population Authority also said the attorney general would be handling the appeal filed by Adalah. Dery’s office insisted that the cases were absolutely not instances of citizenship being revoked but were instead situations of arranging legal status. “The minister has directed officials at the Population and Immigration Authority to handle the process involving this group of people in the easiest and simplest way possible. Minister Dery asked them to find any way possible to shorten the procedure in an attempt to avoid imposing any hardship on them,” said the office. The attorney general's office told Adalah that the Population Authority is conducting an examination of thousands of people who have been erroneously registered as citizens instead of permanent residents. Those who are found to have been registered as such by mistake will be allowed to obtain citizenship through an accelerated process, should they meet the legal criteria, the response said. According to the response, no one has been denied citizenship so far, and residents' rights are being maintained. Therefore the attorney general sees no reason to intervene in the Population Authority's decision, the response said.